Gone are the days of super styled curled traditional prom hairstyles and now are the days of girls with long hair wearing braids, half updo’s, unkempt styles, and funky hair accessories. We are going to break down the top trends in prom hairstyles for long hair this year. Rather you are wearing a fishtail braid, French braid, or braid in a bun, braids are a timeless beauty and perfect for prom. Your long locks are on display but still pulled back so you can dance the night away stress free. What braid you wear depends on your style and your dress. For this year though the fishtail braid is definitely extremely trendy, and the braided-crown is unique and gorgeous. If you have opted for a strapless or spaghetti strap dress then wearing your hair parted to one side and with long waves, bouncy curls, or sleek and straight is perfect. If your dress is a halter-top or completely covers your chest then wear your hair up. Another perfect look for long hair that is left down is vintage curls. Vintage is one of the biggest trend this year and having the 50s throwback curls framing your face is perfect if you want to stand out and leave your hair down on display. This trend is perfect for all dress types and personalities. This look is perfect for those with a little bit of natural wave. 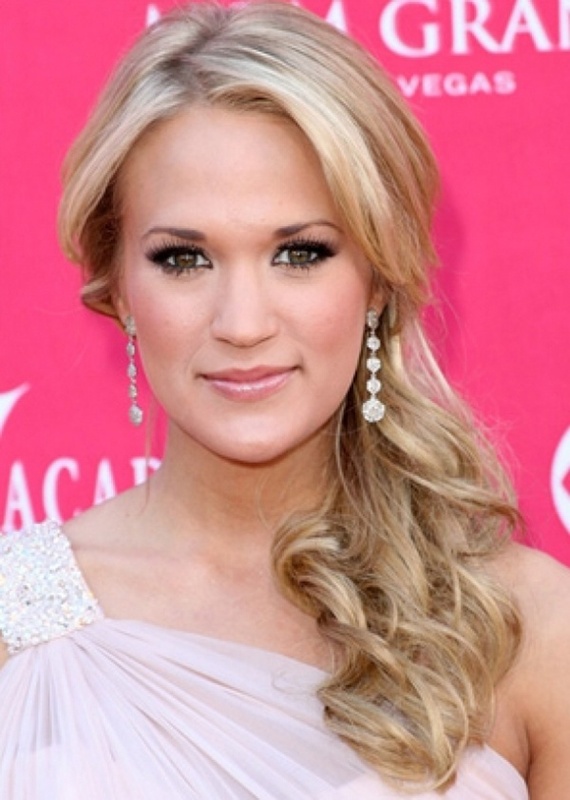 If you have pin-straight hair then you will have to add some wave for this look but its well worth it. There are countless options for the messy up-do. Pulling your hair back at the crown and leaving most of your long locks down with big beautiful curls is a classic prom look. This can be worn with any style of dress and is the ultimate glamour prom look. If you are looking for a simple and fashionable look, then a side swept pony is perfect for you. It can be easily styled, and the simplicity allows you more room for extravagant accessories, and to show off your dress and make-up. Having long hair during prom season opens the door to countless styling options. If you are having trouble determining how you want to wear your hair for prom night – let us help. The decision should be based on your personal preference, the style of dress you are wearing, and prom theme.